Roboto got a facelift! What follows is my attempt to catalogue (in a coherent fashion) some of the changes in the new Roboto. Grab a snack. The short answer is "a lot." These differences aren't immediately noticeable to the naked eye, especially if you're viewing the font on a 4.7" screen, but there are a lot of them, and they combine to make Roboto just a bit more refined, balanced, and dynamic than before. Don't worry though, it's still the humanist sans serif made for high resolution screens you've come to know and love. 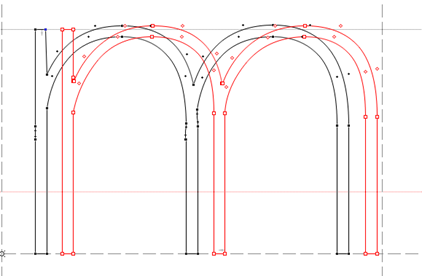 If anything, its "friendly and open curves" have been enhanced, while maintaining overall logic and consistency of style. For the sake of brevity, we'll take a look at two weights that best demonstrate the changes – Regular and Thin. First, we'll look at Roboto Regular. The regular weight is what you'll see most often, and its changes are more indicative of the stylistic evolution of Roboto as a whole, where the Thin weight shows several issues with the way the font was built that are now fixed. But we'll get to that. I could do a full run-down of all the 1000+ glyphs in the set, but we'll just take a look at a few notables. Many of the adjustments are very subtle – minor changes to curves in lowercase letters, a few width adjustments, the legs of the capital "A" moving outward just a bit, the arms of the capital "E" and "F" growing a tiny bit longer (while maintaining staggered lengths), etc. A few interesting things are happening though, too. For one thing, the (what I like to call) boot heels on the lowercase "b" and "d" (as well as on the top of "p" and "q") have straightened out a little. 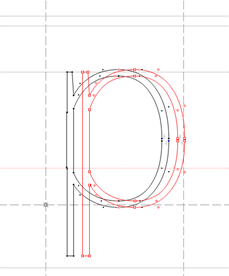 Also of note: the bowls on the lowercase letters (which Matias Duarte lovingly refers to as "racetrack" shapes) have been trimmed ever so slightly. 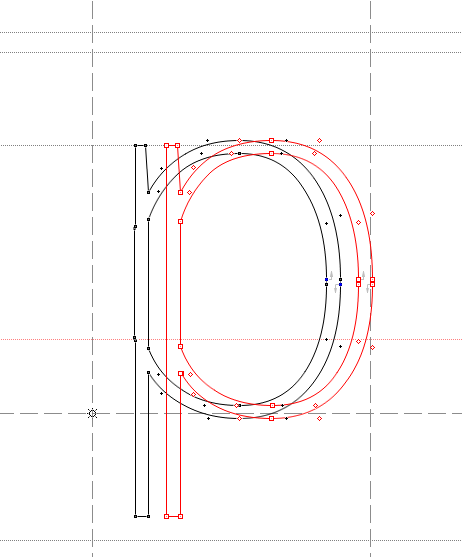 The bowl of the uppercase "B" meanwhile has calmed down significantly, giving it a little more balance, where before its voluptuous curve gave it a certain bottom-heaviness. Of course, the letters aren't the only thing that got updated. Punctuation got some changes too. The most obvious change is in the commas. Roboto's old commas were all about the "geometric" skeleton of Roboto past (not to say geometry is gone, it's just … softer). It was made purely of angles. 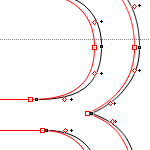 The new comma has a really nice curve, and looks great in high resolution. Other punctuation marks didn't undergo such a dramatic shift, but were subject to the tightening of curves and narrowing of widths seen elsewhere. The changes in Roboto Thin are an even more interesting story. Those of you who follow me on Google+ might have caught a post I did several days ago about Roboto Thin. Out of curiosity, I looked at the Thin file from the Android 4.3 build and, what do you know, someone already fixed all these issues! The issues with the aforementioned letters all seem to have been cleared up. Strangely, one thing wasn't fixed – the capital "M". Here's a before and after. Before, the peaks were uneven – the left higher than the right. Now, the right is higher than the left, but just slightly. 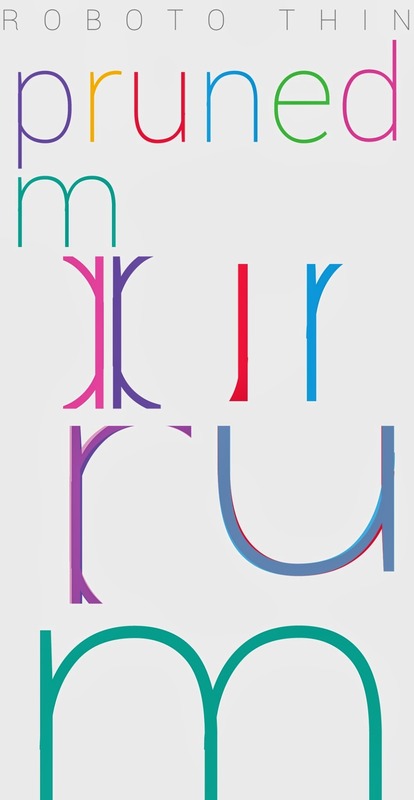 Just like its Regular weight counterpart, the Thin "M" also has a more subtle, refined set of angles inside its peaks. With most of its pesky issues resolved, Thin has become a much better option, though – at the time of writing – it's an extremely rare sight on devices. With the rise of higher-resolution displays, though, this may change. Overall, the stylistic changes to Roboto seem to point to an effort to make the typeface more balanced. 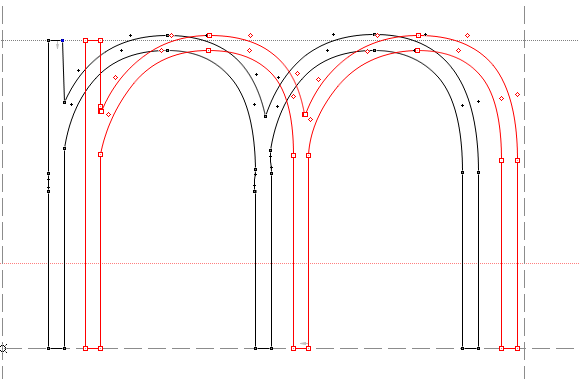 Rhythm, as the specimen book explains, is extremely important to Roboto's form, and bringing on more pleasing curves and widths that at least balance out the individual glyphs contributes to that goal. As much as the typeface strove for a mix between humanism and geometry, it's achieved that goal on a new level with the 4.3 refinements. Things are more subtle but more organized. Softer but more logical. And, best of all, the Thin weight is less burdened by weird errors. Though Roboto initially faced some significant tension when it debuted with Ice Cream Sandwich, it's getting better and better. It's great to see that the typeface is still being tweaked, worked on, and improved. Love it or hate it, if you like typography, Roboto is interesting. The fact that changes are still being made makes it a great font to look at up close, and I for one can't wait to see how it looks in a new version of Android. Want the font for yourself? Hit one of the mirrors below.